Pumpkin… it’s my new obsession. I’ve never baked, nor cooked with pumpkin before, and now that I have… let’s just say I’m never turning back. These days I just want to make everything pumpkin. Literally everything I think of, somehow pumpkin makes it’s way into the recipe… next up this weekend is pumpkin waffles! So what’s better than pumpkin you ask? Well, pumpkin AND chocolate. Yes, we’ve officially entered fall baking heaven. 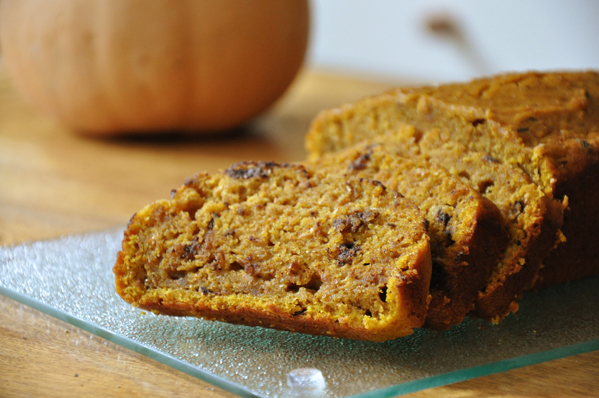 Here’s a delicious recipe for a moist pumpkin chocolate chip bread. I would eat this for breakfast, lunch and dinner – that’s how good it is. Next, in a medium sized bowl combine the dry ingredients, and in a large bowl combine the wet ingredients. Whisk the dry ingredients into the wet ingredients, making sure it is well blended. Mix in your chocolate chips. Once everything is mixed together, line a bread pan with parchment paper, and pour the batter into the pan. Make the best of the seasonal pumpkin and bake this bread – you won’t regret it. What a good introduction to baking with pumpkin. There really isn't anything quite as delicious as pumpkin and chocolate! Delicious looking bread! I have a bunch of people staying over next weekend and I am thinking this is the perfect breakfast treat to serve in the morning. Thanks! Yes, definitely a great breakfast treat! I ate it for breakfast every morning, hope you and your guests enjoy it! Let me know how it turns out! I love this bread! I have made it at least 8 times now and have only experienced a problem once. One cake had a couple alterations and still came out great.Oridinarily I make this with extra chocolate chips- more like 1/2 cup.Everyone who has had this loved it as well. It is a super moist bread.My suggestion would be to make this with the whole can and double everything else. One can is about 2 cups pumpkin so it works out great if you just make two breads. That way you do not have to worry about the other half of the can going bad. Just popped this into the oven. I didn't have any olive oil so used vegetable oil...also put a cup of chocolate chips, about 1/2 cup of raisins and about 1/2 a cup of walnuts....will let you know how it turns out!